What’s the next best thing to someone bringing you breakfast in bed? Collecting a ready made breakfast from the fridge, obviously! These delicious, Vegan Overnight Oats in a Jar only take a couple of minutes to throw together, then ‘cook’ themselves overnight. Well not so much as cook, but soak I suppose. Whatever you want to call it, they’ll be ready for breakfast. Last month we posted this ‘How To Make Overnight Oats in a Jar Tutorial’ along with 28 Tasty Recipe Ideas from around the globe, and we also promised we’d follow up with some of our personal favourites. Just grab a (clean!) 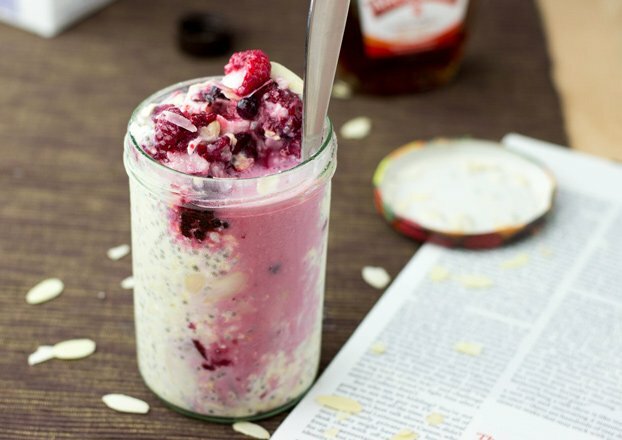 jam jar or equivalent, and begin by putting the oats and chia seeds in the bottom. Add the almond milk and yogurt and give it a stir. That’s it for now. Bung it in the fridge ‘til morning. When it’s ready for the eating, throw in the chopped almonds, berries and a spoon of maple syrup, give it a stir… and you’re done! That’s it! Three minutes of prepping and you’ve got an amazing breakfast ready to go. You can even do both steps at the same time the night before to save even MORE time, though the almonds won’t be quite as crunchy. This dish contains a bit of everything. Porridge oats themselves are excellent blood-sugar stabilisers and have well documented effects on diabetes patients (1). They’re a great way to start the day as they lower cholesterol and greatly reduce the risk of cardiovascular disease. On top of that, the sheer amount of fiber in the dish (61% of the RDA!) adds to these diabetes and heart disease benefits (2), as well as keeping you feeling full for longer – which can help with weight loss or staying slim. Chia seeds deserve a whole book to themselves, but for now I’ll limit them to highlighting the huge amounts of omega-3s, protein, fiber, calcium, manganese and loads of other nutrients! (3). And finally – this lovely vegan breakfast uses no animal products at all – an incredible bonus for all involved (or rather not involved). Deliciously tasty and vegan overnight oats in a jar: High in fiber, great against diabetes and heart disease. Did we mention it’s vegan too? Put the oats, chia seeds, yogurt and the almond milk into a jar. Stir until everything is mixed together nicely. Pro tip: If you have a big enough jar you can also just close it and shake. Boom! Then off it goes into the fridge for the night (or for at least six hours). The next morning add a little more almond milk to loosen up the mix. Next, just mix in the raspberries, syrup and chopped almonds and voilá - breakfast is ready! 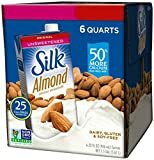 You can use any milk you like - soy or rice, for example, or whatever you have to hand (just keep it gluten-free if needed). Feel free to swap out the berries for a banana or any other fruit you fancy really! 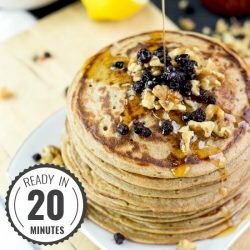 IF YOU LIKED THIS RECIPE: Then you need to check out the breakfast section from godairyfree.org by my blogger friend Alisa Fleming! 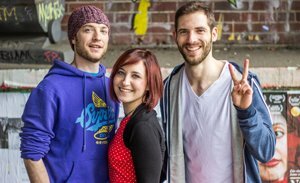 On her blog you'll find lot's of information on a dairy free diet too! If just overnight oats are your thing, go to our post “How to Make Overnight Oats in a Jar Tutorial” for 28 more overnight oats recipes! Thanks to you, I finally tried overnight oats yesterday!!!! This fruity version came at the perfect time, now I have another idea to try 🙂 The pink burst is just gorgeous! I made a new batch just now! Love the color of this! 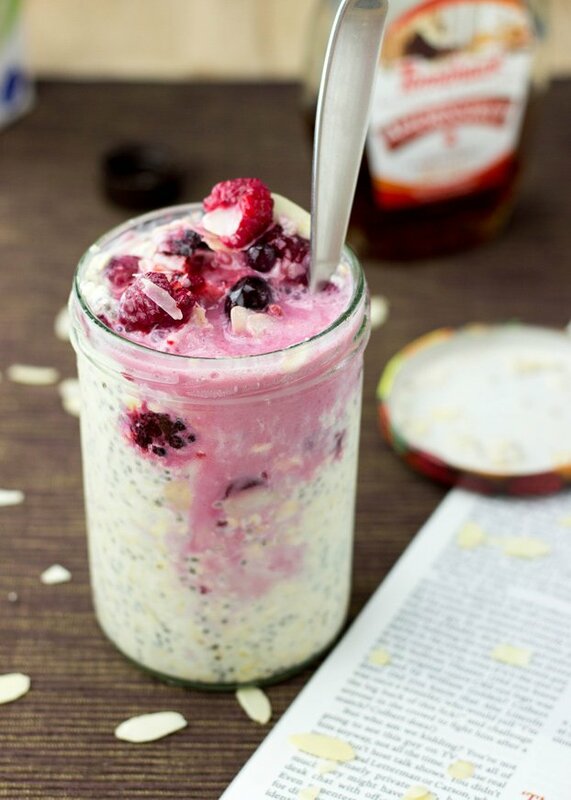 Overnight oats is such an easy way to get your morning started! I have not made OIAJ in *so* long – this has me craving them, it sounds SO good and looks so pretty! 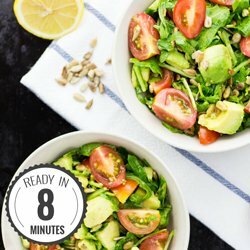 3 minutes – I can commit to that! I love making breakfast the night before. I feel like that sets me up right for the next day. I am definitely set up with this recipe. Thanks! Yess, it’s so nice to have ready made breakfast in the morning! The color on this is so gorgeous!! Sounds so yummy! Overnight oats are the best. This recipe is so perfect, and I love the color! I love overnight oats!! and raspberries are my favourite addition to them too 🙂 Yum! I love oatmeal every way, but overnight oats have a special place in my heart. Thanks for reminding me to add in some raspberries to my next batch! But they won their spot in my heart as well! I love overnight oats, so easy and anything that does note require effort in the morning has to be good, right? i absolutely love when breakfast is ready for me..i dont know why more people arent into this. Wow! Only 3 minutes. I love recipes like this. Oats are my fav! I love overnight oats… so convenient!! Pinning you recipe to try soon. Have not been making overnight oats for sometime. But looking at your pictures, I think I am hopping right back into the kitchen to make some of these yummy treats now! Looking good! 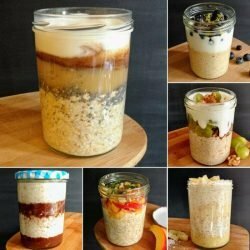 I love overnight oats, I’m not vegan so I make them with regular yogurt but this is a great idea for a easy and quick breakfast and healthy too 🙂 Lovely photos! Such gorgeous pictures. I love waking up to some overnight oats, so handy when you’re in a rush. 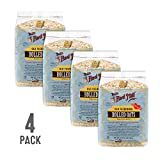 I thought you might be putting these in the microwave to heat up…do the oats cook just like that? The colors here are so pretty! The one thing better than oats in a jar is NO OATS IN A JAR — because I’ve finished them! I.e. this recipe looks epic win!! Oats are my favourite way to start the day, especially overnight oats! These are great! Okay, I have to admin … the thought of cold overnight oats has never appealed to me. But this recipe? It looks amazing! So much so that I’ll have to give it a try! Almost too pretty to eat….. I’ll take two please! Looks delicious! I’ve recently become obsessed with overnight oats thanks to your round-up post recently. I’ll have to try this recipe next! Mmmm, it looks so delicious! 🙂 I can’t believe I haven’t tried this combo yet. Thanks for the idea. Your recipe is amazing! I always get tons of compliments when I make it. thank for sharing it. Do you have to use chia seeds? 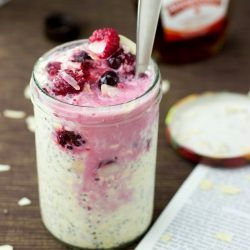 I’ve been looking for some recently but can’t seem to find them, would it be possible to still make these overnight oats without them? Oh my, this jar of creamalicious (yes, a totally made up super-descriptive word!) 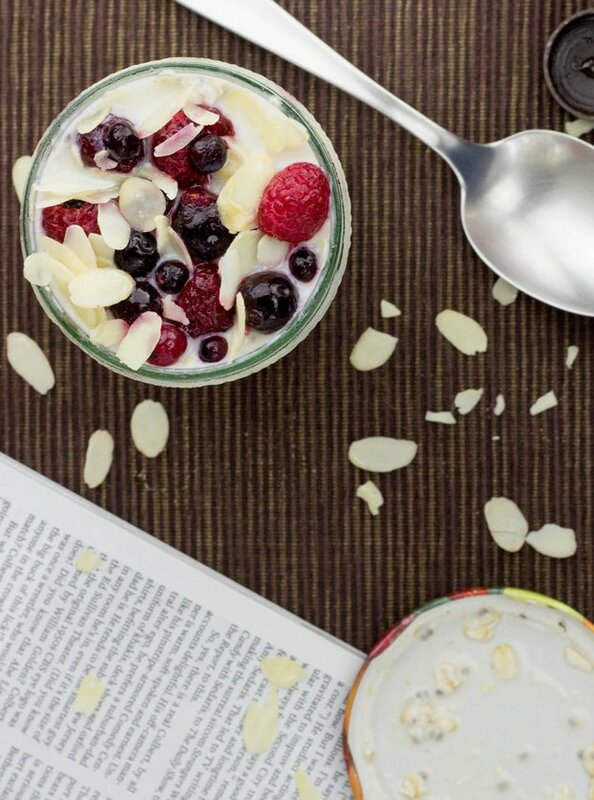 oats and fruit looks absolutely luscious! I’ve tried a few oats in a jar recipes and most don’t cut it, but this one I am totally tempted to give a try. But first, gotta find out where you picked up the adorable jar though (this one and the ones featured in an earlier oats in a jar post with the fruity lids). I use mason jars for everything in my kitchen – presentation and organization is addicting! Looking forward to see what you think about this recipe. Well, those jars are from a grocery store over here in Germany. I guess they’re quite difficult to get where you are, haha. 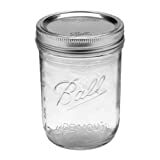 But either way just the “standard” mason jar looks great in my opinion (ridiculously expensive here in Germany though). A new jar for me, use of my descriptive food word ‘creamalicious’! Sounds fair!! ha ha! No, really, go right ahead and use the word – so glad you like it too. Hope it catches on like wildfire….like the overnight oats sensation. Well, I won’t be going to Germany any time soon, so a mason jar it is. Sorry they are so expensive there – rather cheap in the US – around $10 for a dozen pint size. Just bought some lovely raspberries and will try the recipe tonight (and enjoy tomorrow). Thanks again! Hope you are still around ‘cuz I would love to know where I can get the jars & especially the decorative lids that you used in your Overnight Oatmeal recipe. Hi Toni! We usually recommend these jars: http://amzn.to/2EoCM2K. I’m not sure exactly where the pretty lids came from, but I’ll certainly ask Hauke when he’s back from holidays!